You have passed out of college and are quite ready for the new period in your life. It could be that you are out in a job search or it could also be that you are someone unsatisfied with your current job and on the lookout to join in another one. On the other hand, have no worries, your resume can ensure that you land the best job, most suited for your requirements. For this, you would have to make sure that your resume is keyword rich. At the same time, ensure that the keywords that you feed into the search box at the job sites are relevant enough to pull up search results that suit your qualification and experience. We shall have a look at some of the keywords for job search that can be used to pull out the best results. Words or phrases that you feed into the search engines or inboxes of the job sites, in order to pull out the most appropriate listing is known as Keywords. You can also find these expressions frequently used in description of the jobs that are given online as the best suited requirement for a particular post. For example, the term most used to describe the intended job for you are known as the keyword. You can also use it to explain your present or past job postings. First thing that you normally do, when you register with a job search site is to choose the easy option, that is to search for your preferred job posting in the site according to the listed category of job or even as per the industry that you wish to specialize in. This is said to be more effective as they narrow down results after a thorough search of the entire list according to job title, job description, industry and so on. For example, if you are a writer on the look for a job, the first thing you would try is to pull up jobs by entering the keyword ‘writer’, with the hope to get relevant job listings suited to it. You also have the option to search for the job listings given in the job sites, as per the industry such as magazines, newspapers, online sites and much more. On the other hand, you can also decide on function or target role as the basis for a keyword to use so as to narrow down the search a bit more, thus opting for content writer/ reporter/ editor or so on. This search would ensure that results are quite exacting to the requirements. While opting to search for a job, one thing you have to be clear about is what you have done so far. You might also need to specify what your target job title is and how different it is from your current or previous job title. This also helps to ensure, that you have the option to search for the job listings in the best job search sites, by entering the keywords such as the current job title to pull out eligible listings. Another thing that you could do is also to feed in the target job title as the keyword, to get appropriate search results as required. Apart from Job title, category or industry, the job seeker can also narrow down the job listings pulled up, based on the zip code, area, region, place and more. This sure comes in handy for people who have certain preferences on where they want to work. For example, if you are keen to work in Bangalore, you can enter the detail in the search box or use it as a keyword in the job search. What you would need to do is to feed the required geographic location, zip code, area or to enter the name of town, city or country in the keyword search option given, so as to narrow down the results pulled up during search. That is you can feed in Bangalore, Karnataka or India in the search option as you would prefer. If you wish to work for a specific company, then use the company name as the keyword to use in the job sites so as to narrow down the job listings pulled out in the search results. Another option that you could try is to find the website of the company via Google. If you are lucky enough you could find your preferred job opportunity mentioned in the career section of the company website. Skills or your capabilities certainly are very useful while searching for a job. It would help you to list out your skills, even if you have not had to put it to test in your previous job. Could be that you have learned or attended a course on something, or maybe applied it at work or have some little basic knowledge of it. Take for instance, you picked up some knowledge or skill, outside of your current or previous job but you are sure it could be highly of use for your target job. In such instances, make sure to mention the skill in your resume as it could help you in finding the most suitable job. Some of the examples of skills that you have mastered or at least have knowledge of could include HTML, basic knowledge of Dreamweaver, Java, C++ Basics, your ability to drive or your knowledge of MS Office and so on. One thing you have to consider is how can you be so sure that the job posting that pulls out in the search list is one that suits your requirement? Chances are despite the keywords mentioned in the job listed on the site; your resume may not get noticed if someone else has experienced better suited for the job than you. Hence, to make sure that the job listing that you pull out is most suited for your requirement, you also have the option to search for a job based on the experience that you have. You can use keywords suitable for your intended job, however never ever resort to a lie in your resume in order to land a job. A Lie can be easily spotted at a later date if not earlier and you could get into trouble for that. Hence, make sure that you do not ever provide any wrong information. To ensure that you would be hired, it would be best if your CV has good resume words that are needed to attract the attention of the employer. Ensure, that you mention your current and previous job listings along with title and experience, as well as capabilities and key skills in resume that you have. Educational qualification is also to be mentioned in the resume with your experience so far cited. Regardless of whichever position you are applying for, your resume should be made more accessible for the recruiters. Make sure it has the suitable keywords similar to what is entered by the company so that any recruiter looking to employ people for that preferred position will be easily able to find your resume. Example would be, your resume should have top search Keywords such as Content Writer/Editor, 8 yrs Experience or HR Manager 5 yrs exp with qualification MA Communication and Journalism or MBA Human Resources specified in your resume. To make sure that your job posting is pulled out in the search results, fill it with some three or five keywords most suited. This will also help to amplify the importance of the page. However, make sure that the key words are not used too much within the 150 words used in the job description. Make sure to use Keywords related to the industry or job profile, as they would be more suitable to use. If you are looking for job as a content writer, instead of the more broad term of writer, use the term Content Writer or Online Content Writer and don’t forget to add Freelance Content Writer if you are looking for work from home option. This sure helps to narrow down your search results. Some other examples of keywords to be used in advanced job search specific to the role that you want includes HR Executive/Recruiter, HR manager, Marketing Trainee, Web Designer, Graphic Designer, Copy Writer and so on. 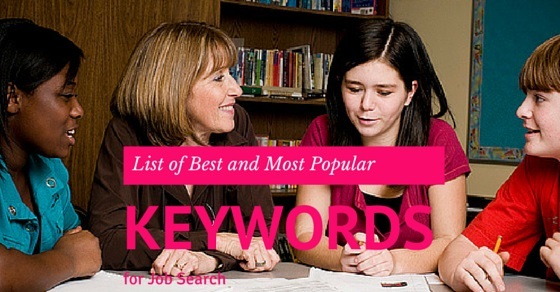 Use very definite keywords while searching for jobs on sites, rather than using more common terms. For example, a writer is rather broad term includes all kind of writing, editing or reporting jobs, where as a content writer in finance or online magazines makes it more specific. You could also search for HR Manager Finances or HR Recruiter, specific to the job role that you wish to assume. When you use more common terms, chances are also there for more people to apply to it, thus eliminating your chance to get called for an interview. People with more qualifications, skills or experience may get the job. Previous articleHow Long Should a Cover Letter Be?